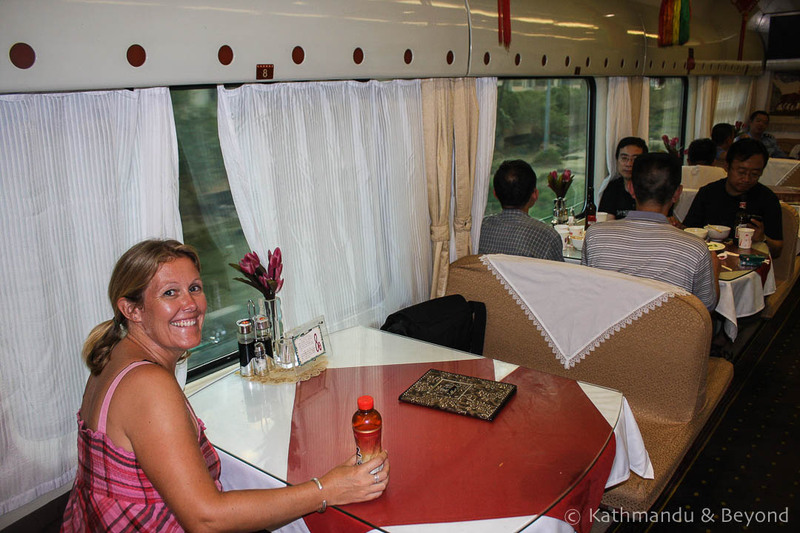 Our three-week journey through Tibet began with a VERY long train ride from Beijing to Lhasa from where we journeyed along the Friendship Highway to Gyantse and Shigatse, visiting places of interest along the way. 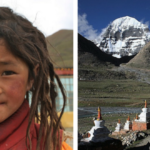 At Lhatse, we veered off the Friendship Highway and headed through remote western Tibet to our ultimate goal, sacred Mount Kailash, where we undertook a 3-day circumnavigation, the famous kora. 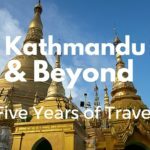 On completion, we retraced our steps and re-joined the Friendship Highway once more and travelled the final section to Kathmandu in Nepal. It was a journey of a lifetime. Despite the best efforts of the Chinese authorities, we witnessed and learnt about Tibetan culture. We also visited some incredible monasteries, experienced amazing scenery and managed to successfully circumnavigate one of the most sacred mountains on the planet. The trip wasn’t without its hiccups, however. The weather was very up and down most of the time we were there, our guide was not as experienced as we would have liked and this led to run-ins every now and then plus we were often put in crappy accommodation even though we paid quite a bit of money to be in Tibet in the first place. Would we go back? Possibly not – as I’ve said, it costs a lot of money to travel in Tibet. 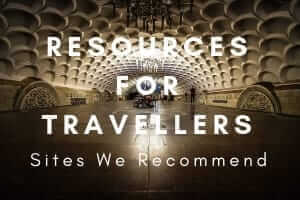 Count on at least US$100 per day as you must hire transport and driver and have a guide with you at all times. 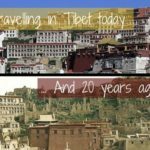 Plus, you are often made to stay in sterile, more expensive Chinese-style hotels even though cheaper and better Tibetan-run options are available. 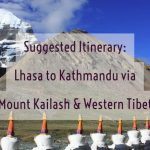 Permits and entrance fees also add up (as they do in China nowadays), especially if you want to get away from the usual one-week trip that takes in Lhasa, Gyantse, Shigatse and Everest Base Camp. 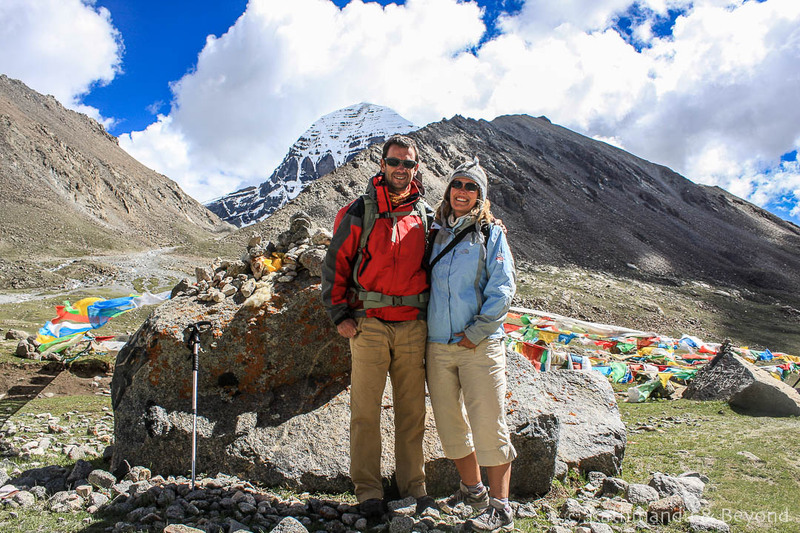 I can’t remember how much our permits cost for Mount Kailash but they weren’t cheap and we needed quite a few of them (one to trek, one to pass through the region, one to get close to the mountain etc.). On the plus side, at least all permits are handled by the company you book through. 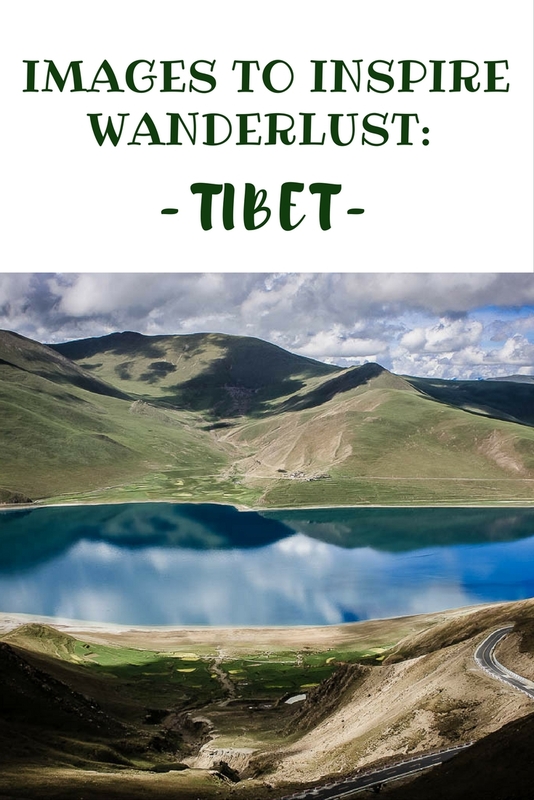 Instead of returning to Tibet, we would consider a trip that skirts the Tibetan border, namely through northern Yunnan, Sichuan and Qinghai provinces. These areas are very Tibetan and generally you are free to travel independently using public transport and without the service of a guide. 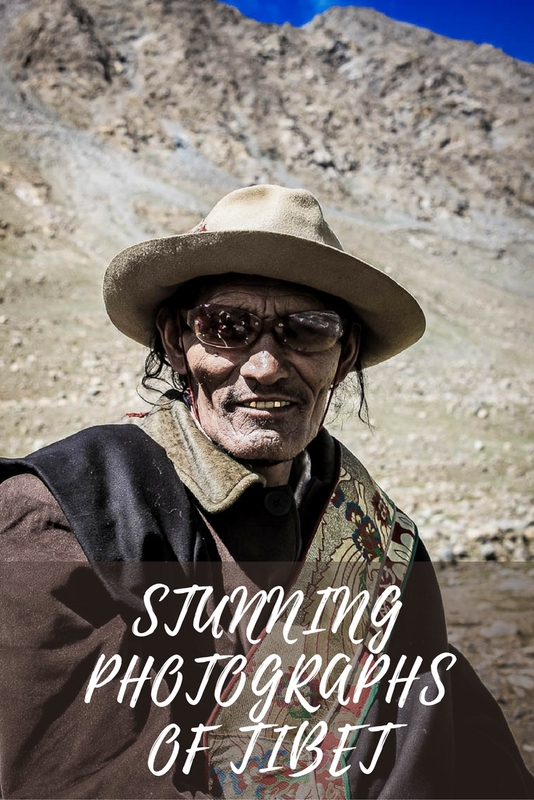 That said, we have very fond memories of our time in Tibet and below is a selection of our favourite photos from that trip, accompanied by the odd anecdote and a few tidbits of information thrown in for good measure. 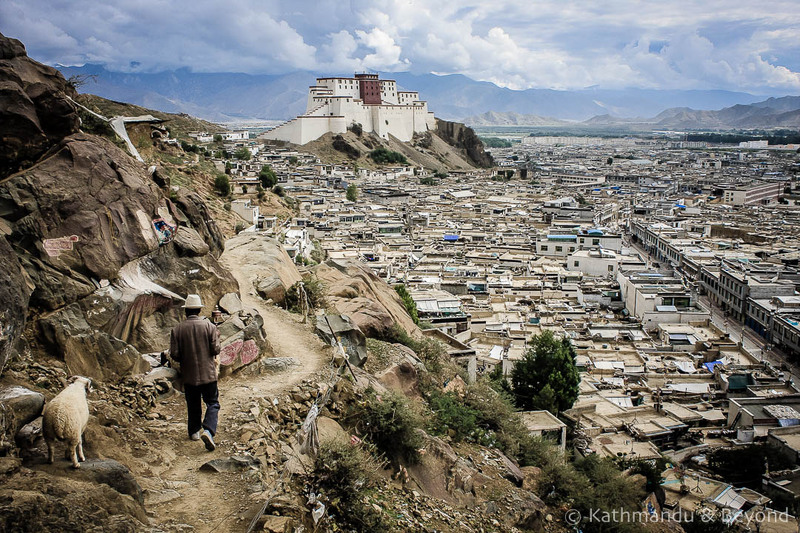 The Barkhor is the spiritual heart of Lhasa and where every Tibetan pilgrim begins his or her spiritual journey. The train from Beijing to Lhasa is the highest and longest railway in the world. The journey reaches an altitude of 5,000 metres, is 4,000 km long and takes 45 hours to complete. If only it could remain stationary at night so not to miss any of the incredible scenery! 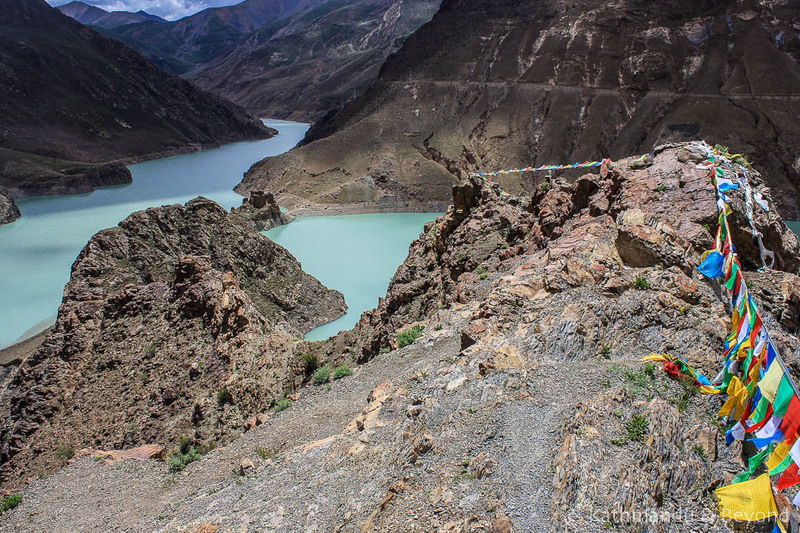 This gorgeous turquoise man-made dam is en route between Lhasa and Gyantse. 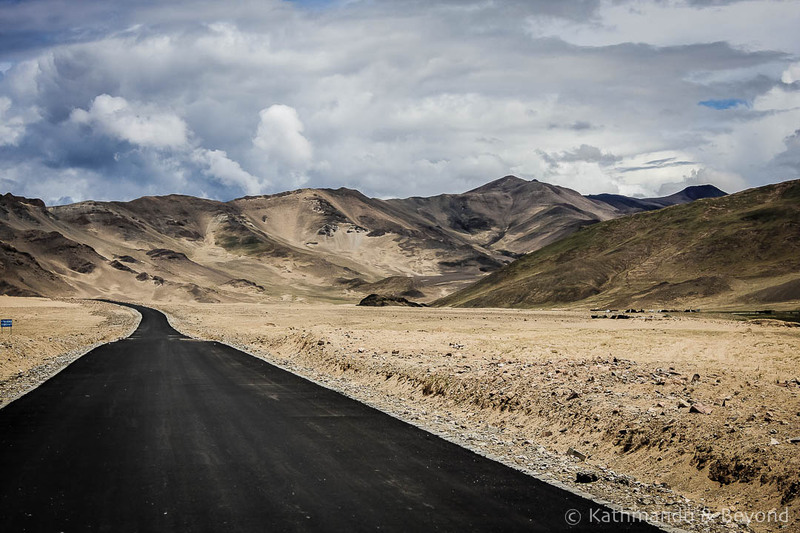 The perfectly smooth tarmac road that initially leads to Mount Kailash in western Tibet doesn’t last for very long! 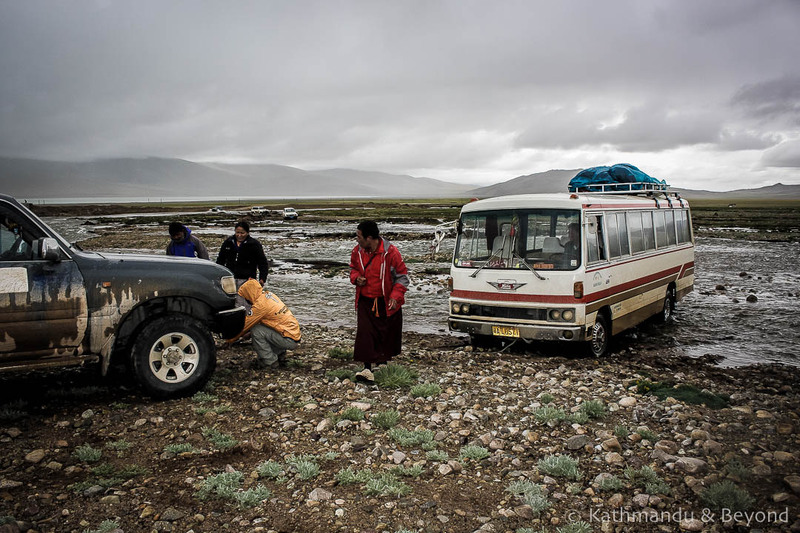 Collecting karma tokens en route to Mount Kailash as we help rescue a bus that has got stuck in the river. 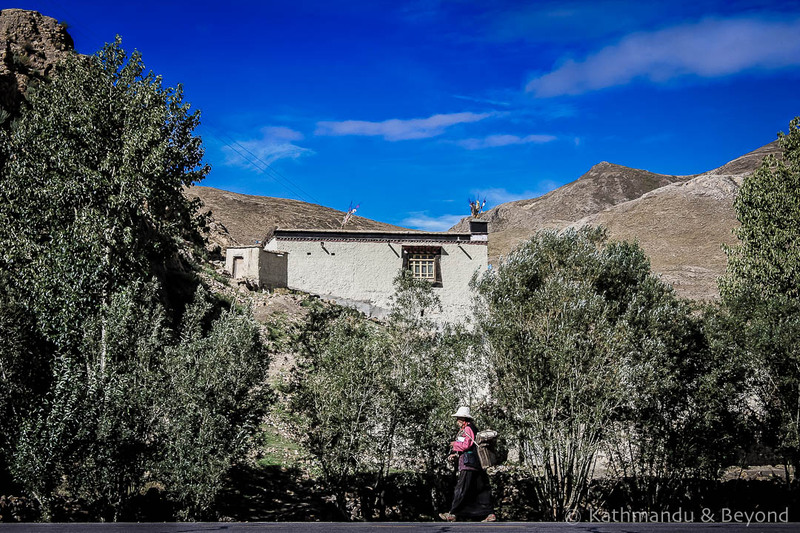 A Tibetan lady on a mission … en route between Shigatse and Sakya. Destroyed and reduced to rubble during the Cultural Revolution, Ganden Monastery was eventually rebuilt and returned to its former glory. It is now home to around 400 monks. 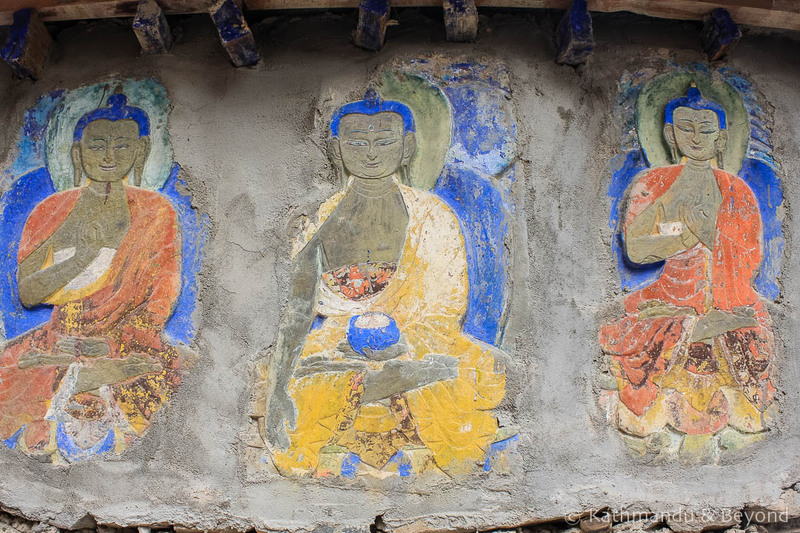 Ancient Tibetan artwork at the base of the Gyantse Kumbum, a nine-tiered chorten located within the town’s revered Palcho Monastery. 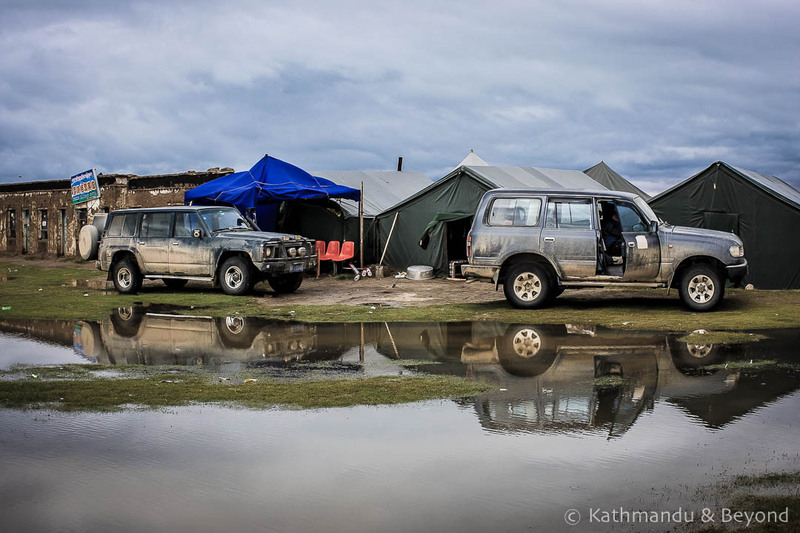 It rained the entire night prior to the start of our 3-day hike around Mount Kailash but we woke up in the morning and it was dry – somebody up there must have felt pity for us! 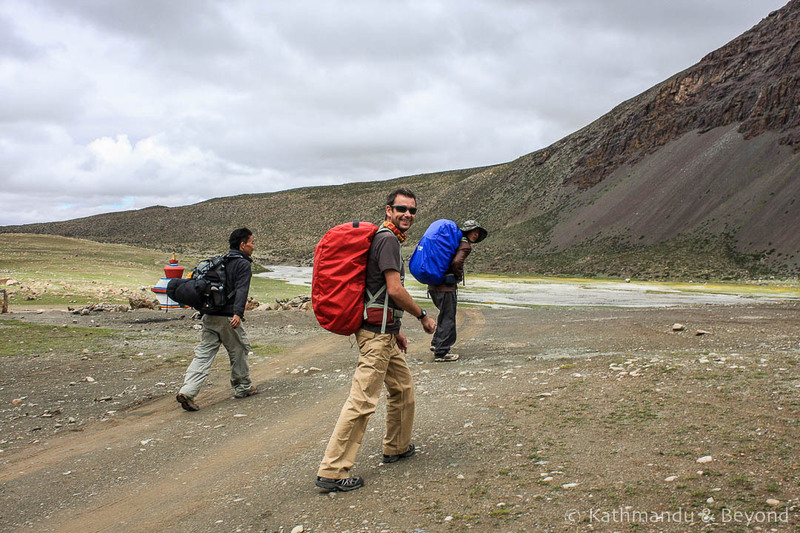 Seeing Mount Kailash had been an obsession of mine for the past twenty years … the grin says it all! 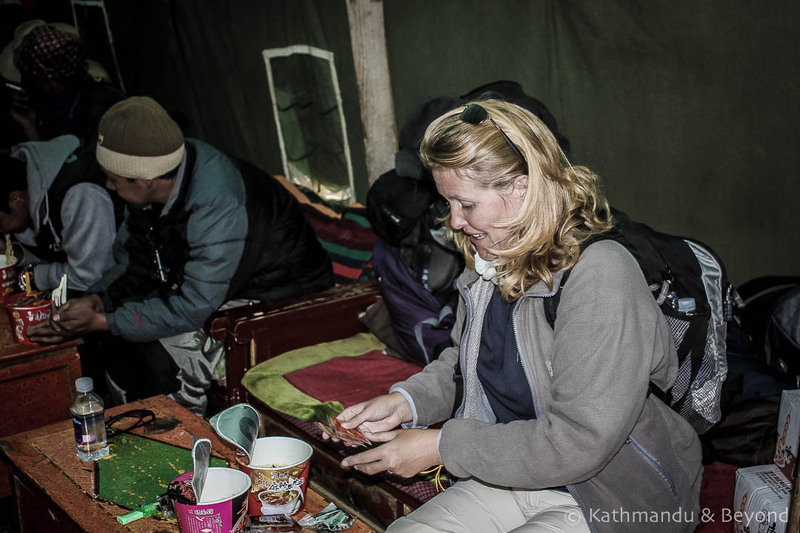 Pot Noodles are an indispensable part of the Mount Kailash trek – Pot Noodle for breakfast, Pot Noodle for lunch and Pot Noodle for dinner. Even the locals eat them – yum, yum! 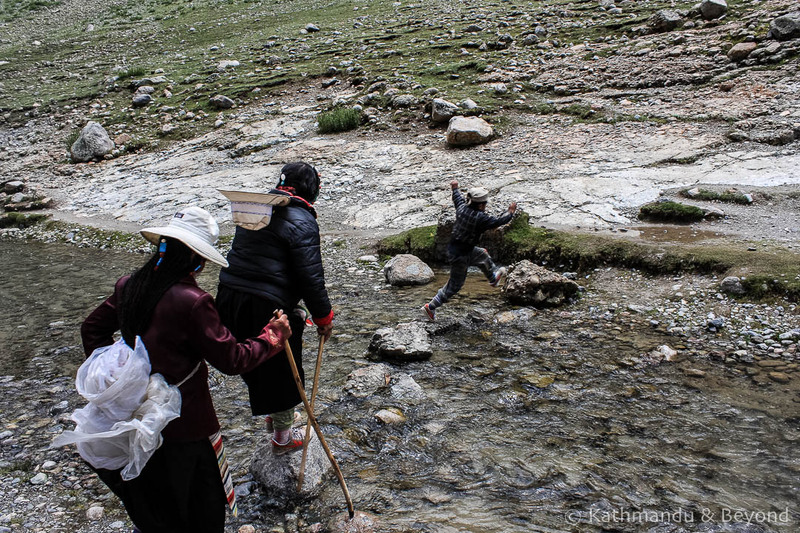 We weren’t quite as acrobatic as the Tibetans when it came to crossing streams like this one. What’s more, you gotta love the decorative bow on the lady at the end – obviously essential trekking gear for Tibetan ladies! 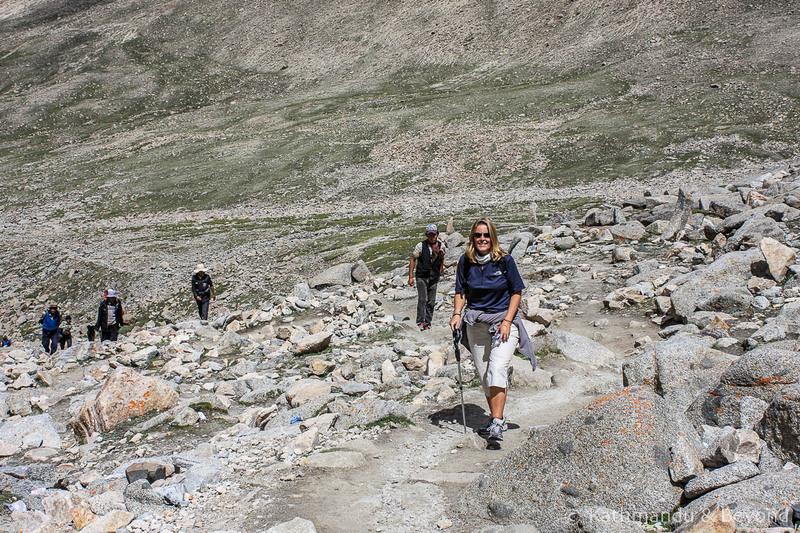 Heading along the trail with our local Tibetan guide. 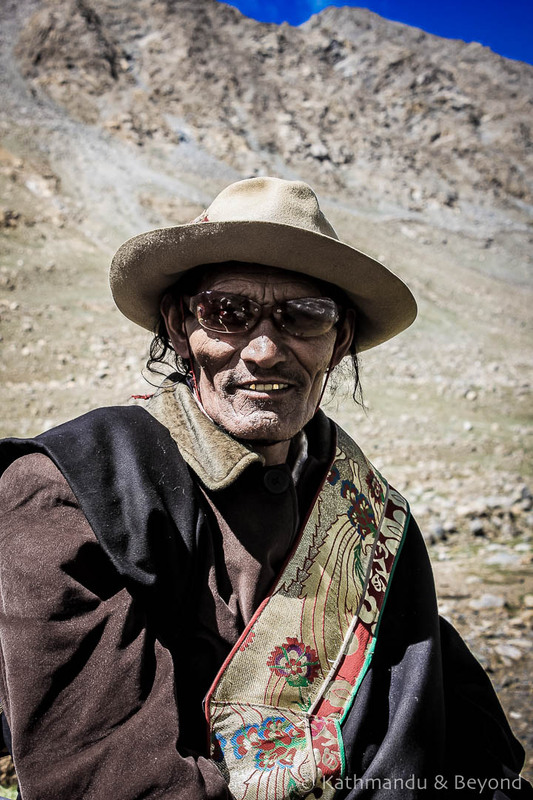 You meet lots of friendly Tibetans on the kora (circuit) around Mount Kailash. The problem is, they offer you a cup of yak butter tea and refusing is considered impolite. 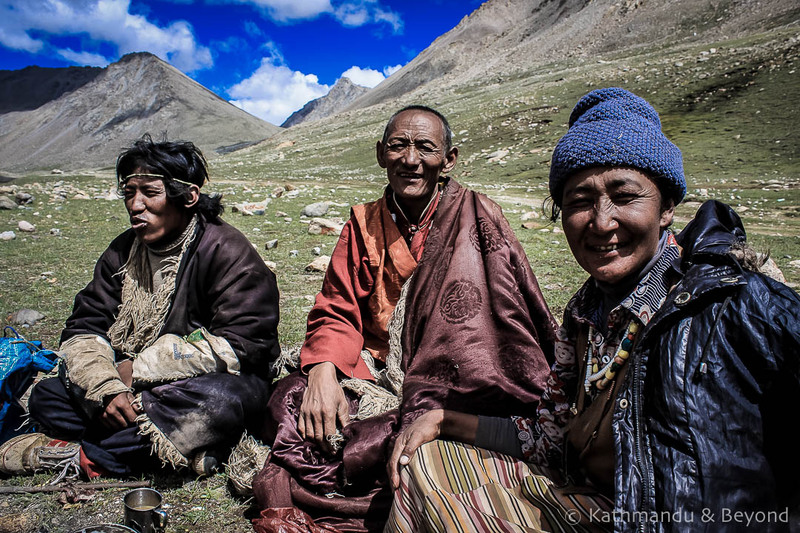 If you’ve ever tasted yak butter tea, you will know what a dilemma this put us in! I said to our local guide that this cool looking guy reminded me of the American rapper, Snoop Dogg, and he proceeded to wet himself with laughter. Of course, the Tibetan guy wanted to know what all the hilarity was about and so we had to explain. Thankfully he didn’t take offence! Happy and posing for the camera just before we set off up the winding path seen in the photograph to the left of Mount Kailash. We weren’t so happy about an hour later when we turned the corner and saw the mother of all hills that we then had to climb. Not only did it stop raining (see Lake Manasarover photo above), the sun came out and we were treated to an incredible view of the most stunning mountain in the world (IMHO). 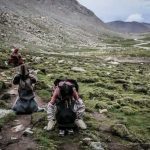 As we had spent about ten days acclimatising before attempting the walk around Mount Kailash, the trek wasn’t actually that difficult. 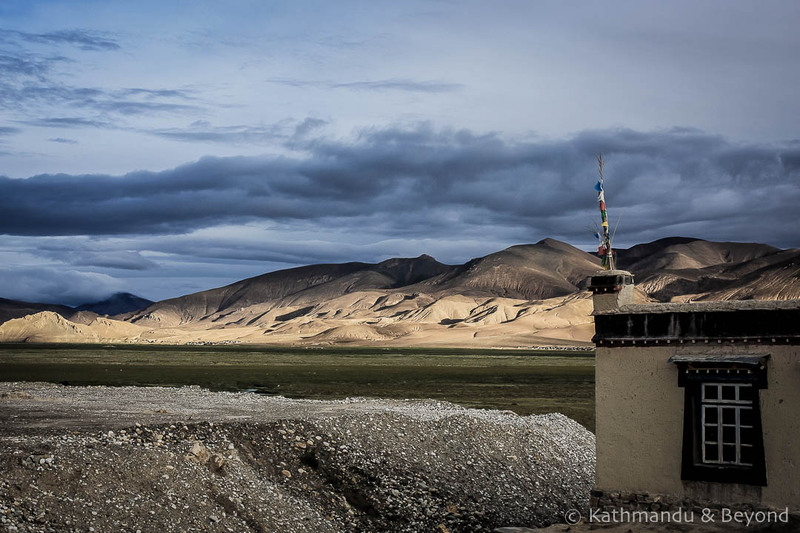 We took it slow and were encouraged along by the numerous Tibetan pilgrims we met along the way. 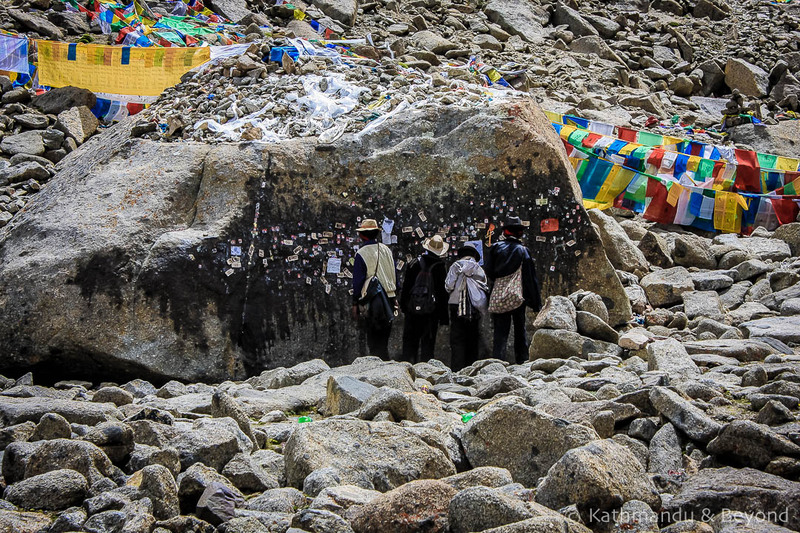 Tibetan pilgrims placing gold leaf on a holy rock on the way up to the Dolma La (pass). At an altitude of 5,630 metres above sea level, the pass remains the highest we have ever been. 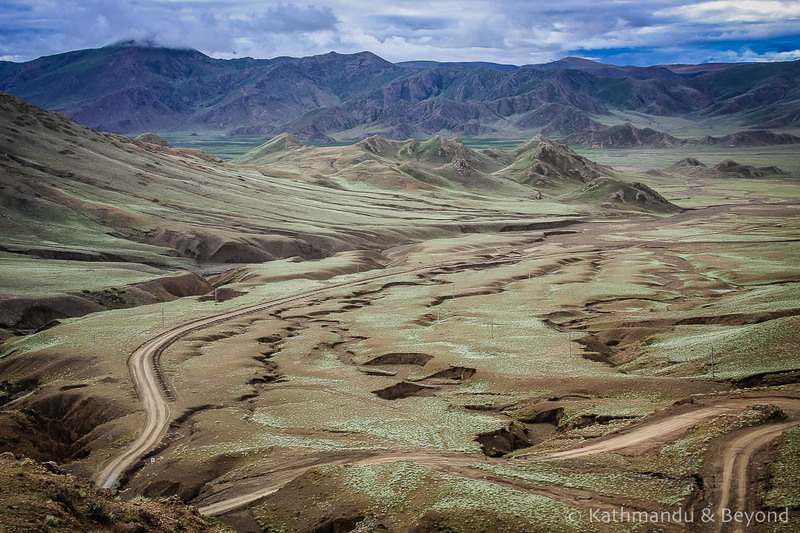 The circuit around Mt Kailash in western Tibet is 52km. 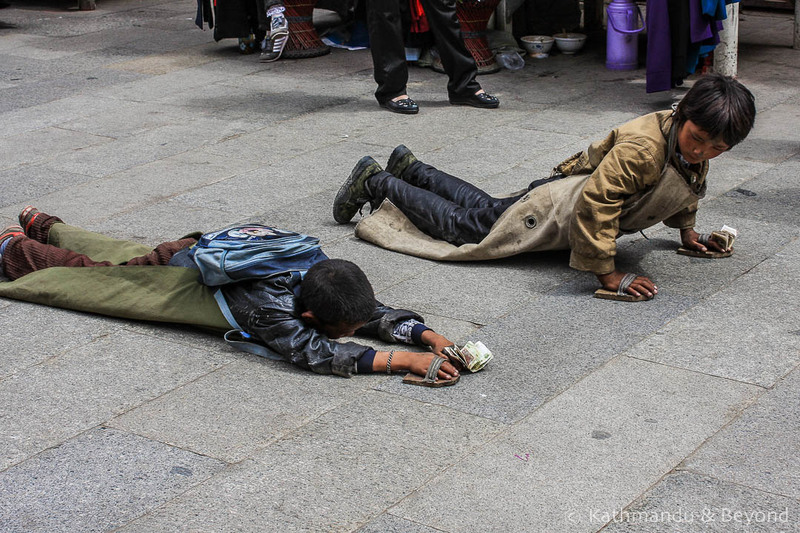 Physically fit Tibetans can complete this distance in one, very long, day and many will do this multiple times. It took us 2½ days to complete our single kora (circumambulation) which is about average but we came across a number of pilgrims who were putting in much more effort than us including these two Tibetan women who were performing body-length prostrations for the entire distance. 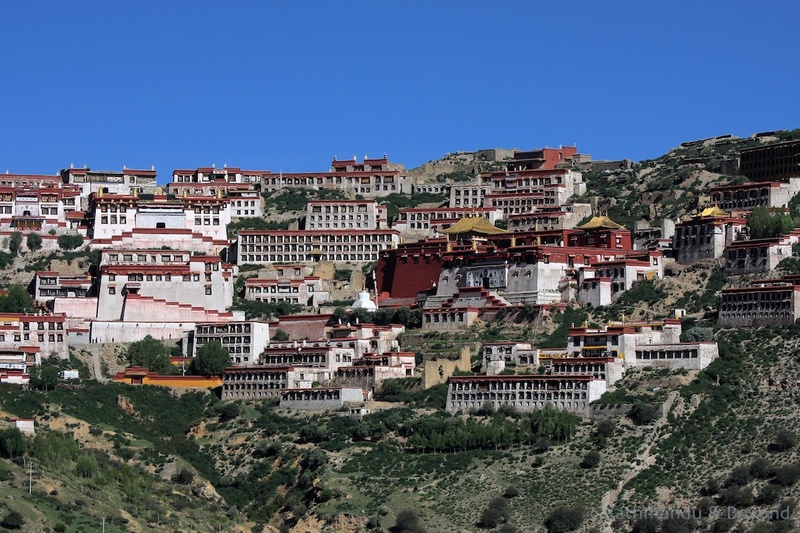 It takes an unbelievable 4 weeks to complete one circuit around the sacred mountain in this manner and it has been known for some devotees to begin their journey of prostration from the Bharkor in Lhasa, some 1,200km to the east of the mountain. 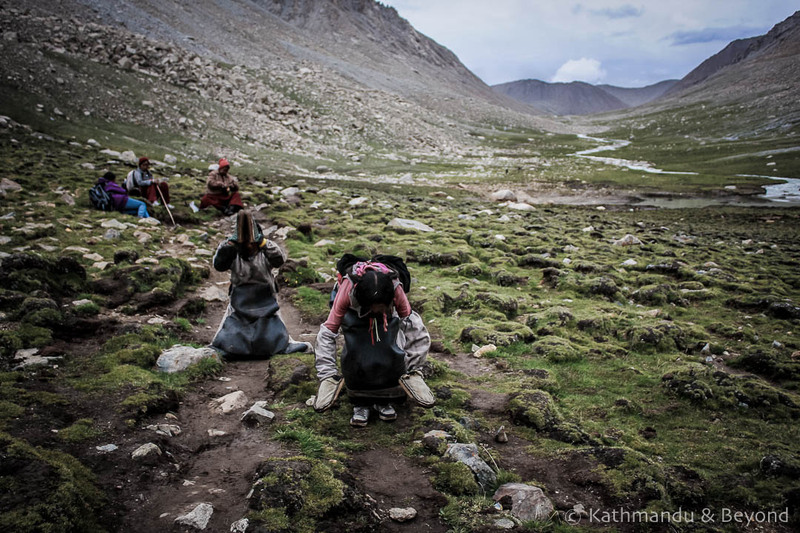 It takes several days of rough travelling to reach sacred Mount Kailash in the west of Tibet. The only real option for tourists these days is to hire a 4WD, which will come with an experienced driver and the mandatory guide. 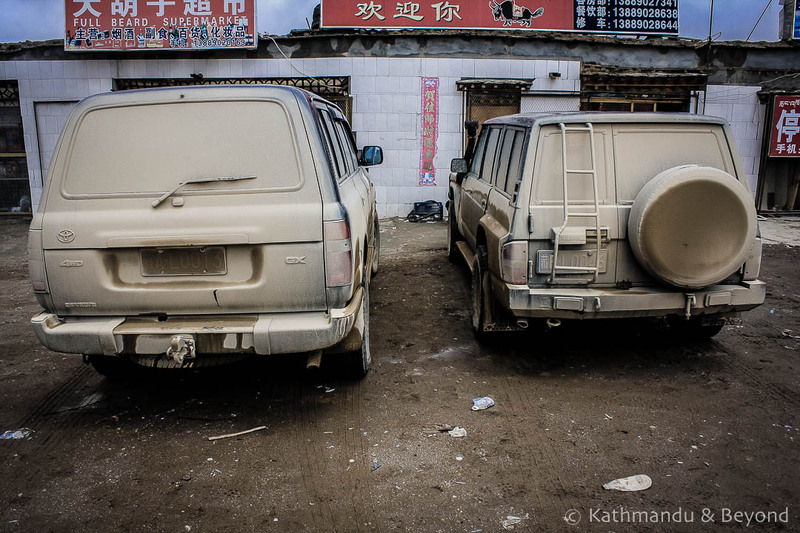 Here’s our trusty Toyota Landcruiser (left) taking a breather while we polish off a bowl of noodles in the remote town of Paryang. Curious faces as we arrive in the one-horse town of Paryang in western Tibet to spend the night. 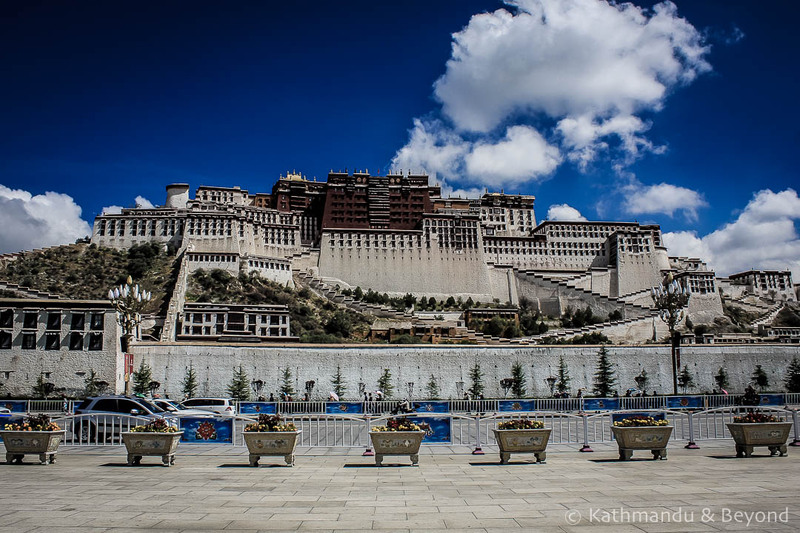 The Potala Palace and its surrounds have seen much change and development in recent years but it undeniably remains the most impressive structure in the Tibetan capital. 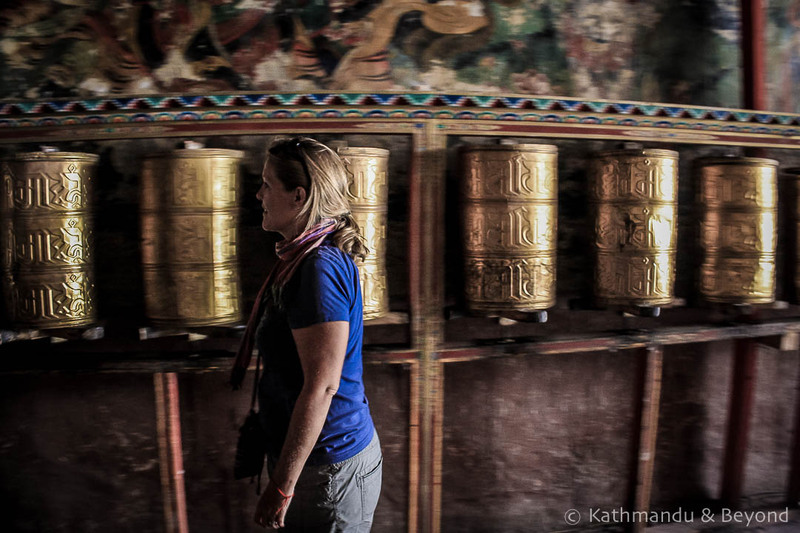 Prayer wheels are an integral part of Buddhist culture and every time you enter a monastery or a place of worship, you should spin them in a clockwise direction as a substitute for actually saying the prayers. 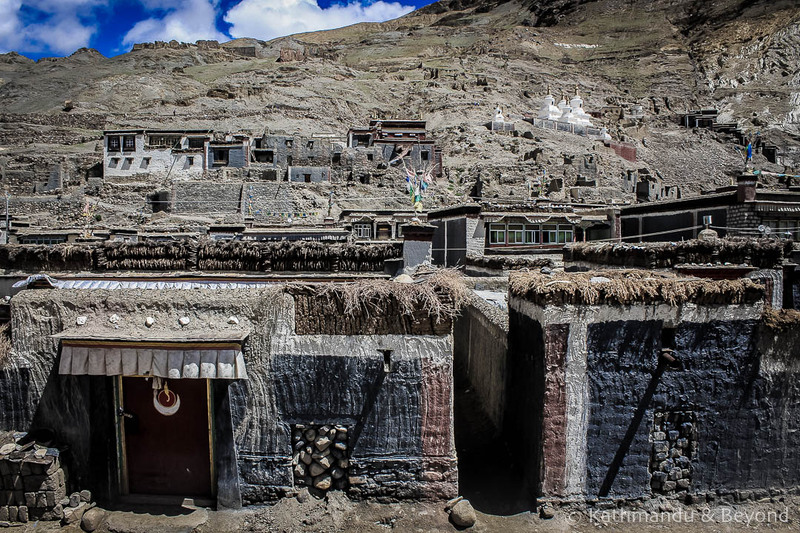 The distinctive slate grey and red brickwork that makes Sakya stand out from other monasteries on the Tibetan plateau. 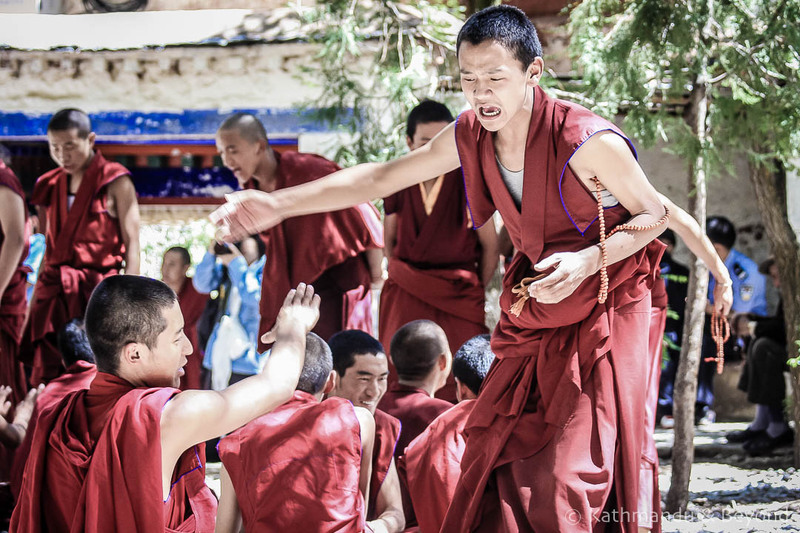 Of course, it’s a serious business, but as an outsider looking in, watching young monks debate at Sera Monastery is a rather amusing affair. They strut around like peacocks and at times you think one monk is going to give the other a right old slap! 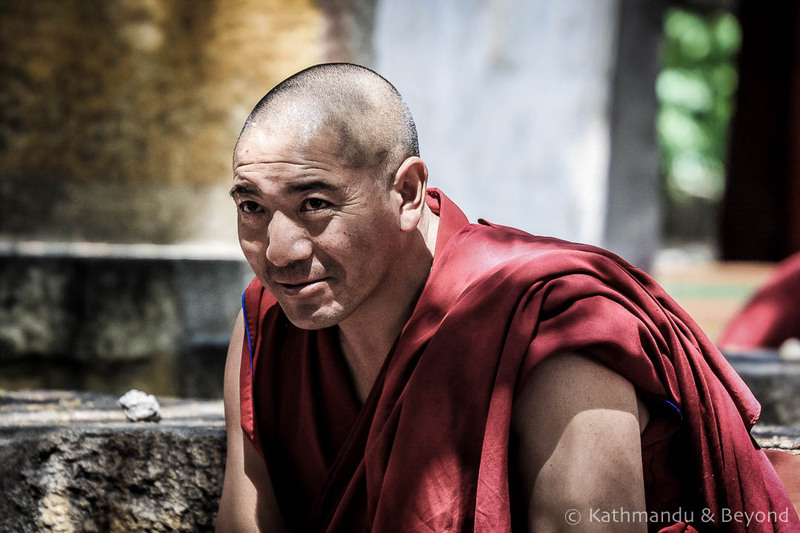 A pensive, older monk looking content as he watches novice monks practice their debating skills at Sera Monastery. 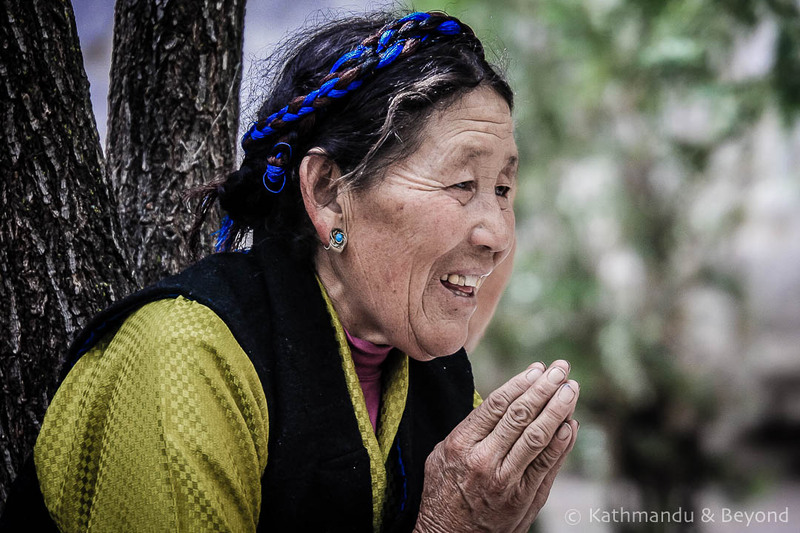 This lovely Tibetan lady was looking on with pride as she watched her son partake in a debate with a fellow monk. Originally constructed in the 17th century and destroyed in 1961 after the Tibetan Uprising that started in 1959, the Dzong (fort) you see today was reconstructed in 2007. Situated at an altitude of 3,800 metres above sea level, Shigatse Dzong is one of the highest forts in the world. 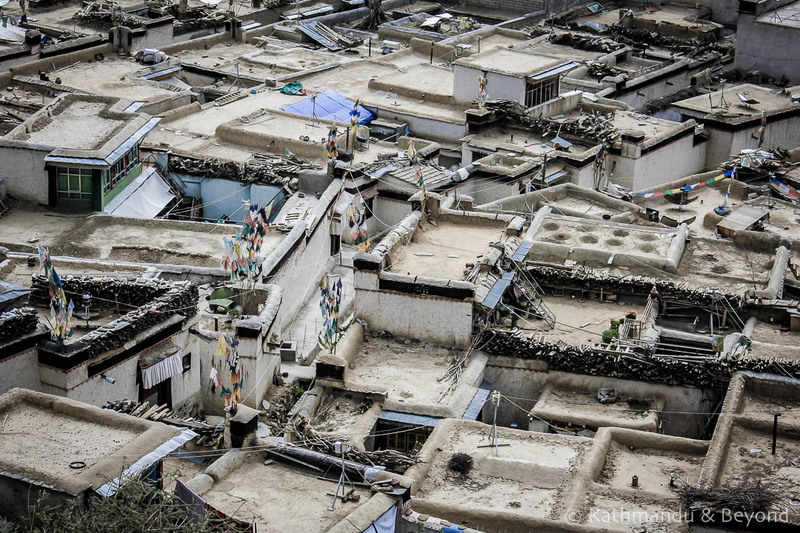 Traditional, flat-roofed houses in Shigatse, the second-largest city in Tibet. 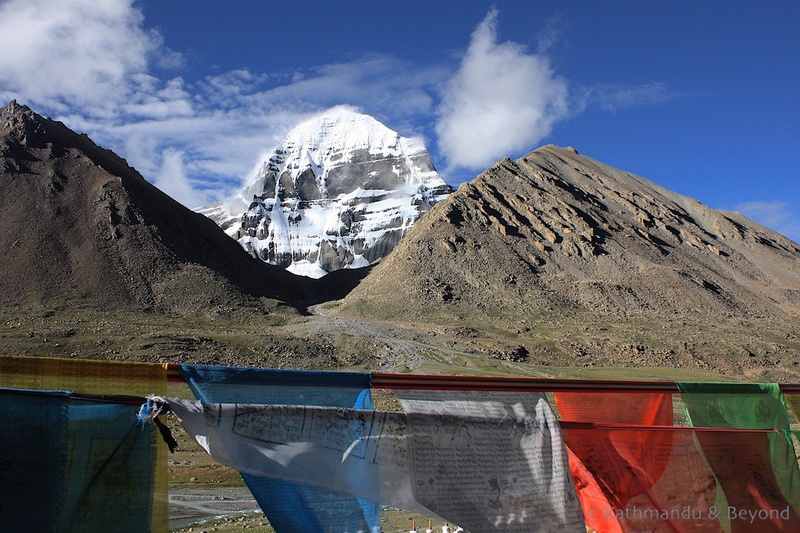 Tarchen is the starting point for the trek around Mt Kailash. 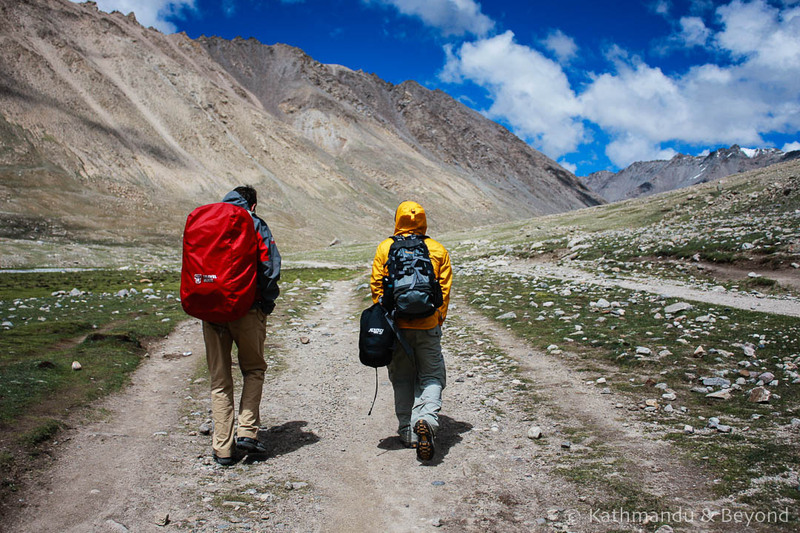 Many pilgrims will complete the normally three-day trek in one, long arduous day. Others will walk around the mountain multiple times during the season (the summer months). No wonder they get through cans of Red Bull like it’s going out of fashion. 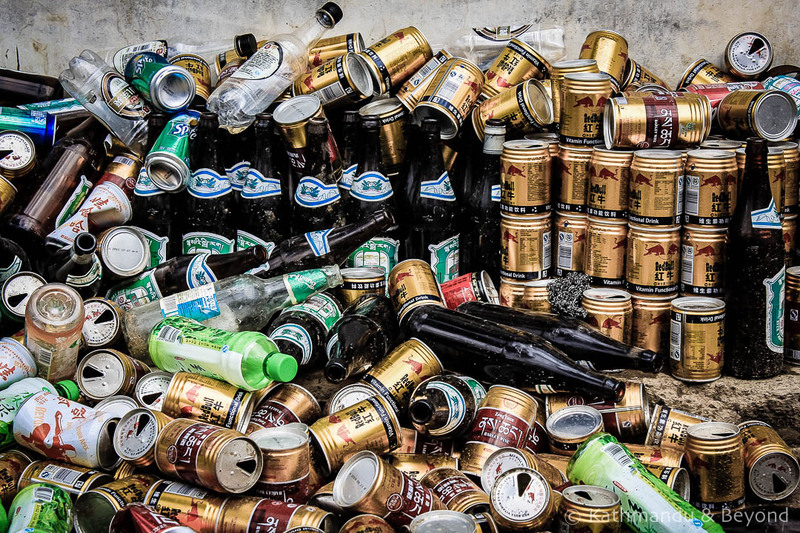 The beer bottles were ours!!! 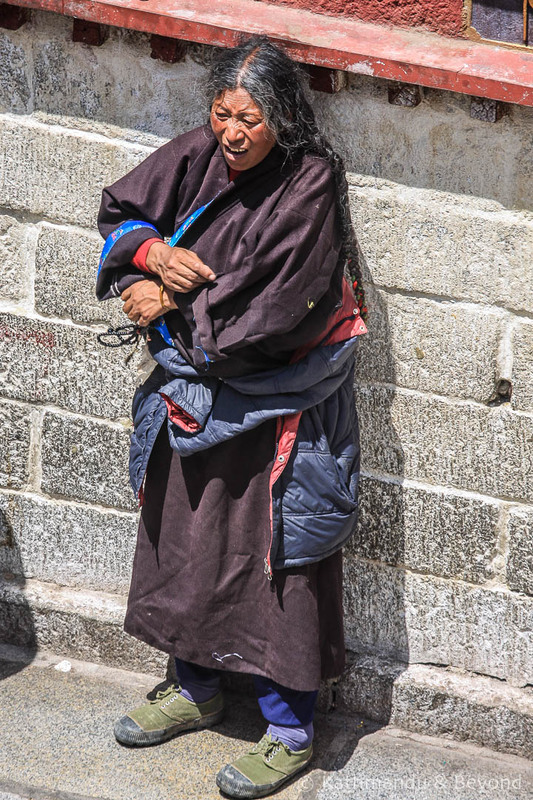 A Tibetan pilgrim resting after circumnavigating the 1,300-year-old Jokhang Temple, the most revered place of worship on the Tibetan plateau. Brooding sky near Tingri, an unremarkable village at the tail-end of the Friendship Highway and the jumping off point for the road to Everest Base Camp and Rongphu Monastery. 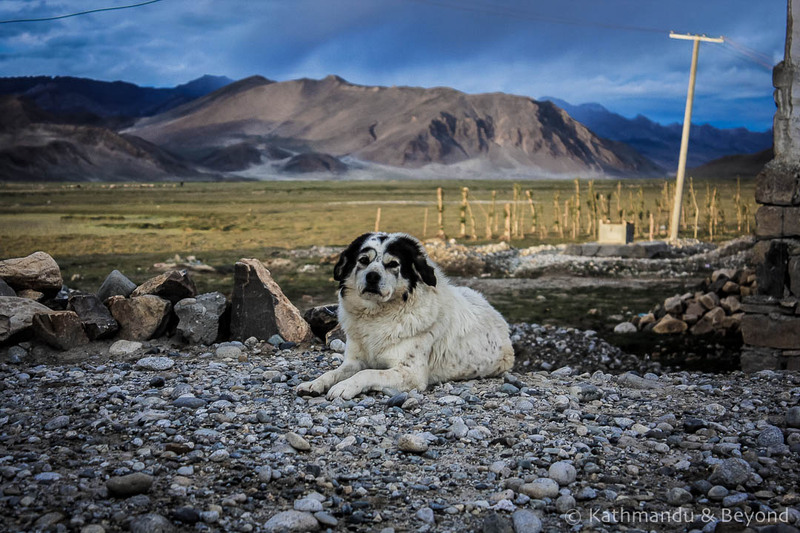 Big furry dogs are everywhere in Tibet. This one in Tingri looked pretty friendly, although this isn’t normally the case and it’s never a good idea to approach them! You don’t come across many nunneries in Tibet. Indeed this one was closed for about a decade during the Cultural Revolution but it is currently home to approximately one hundred nuns. 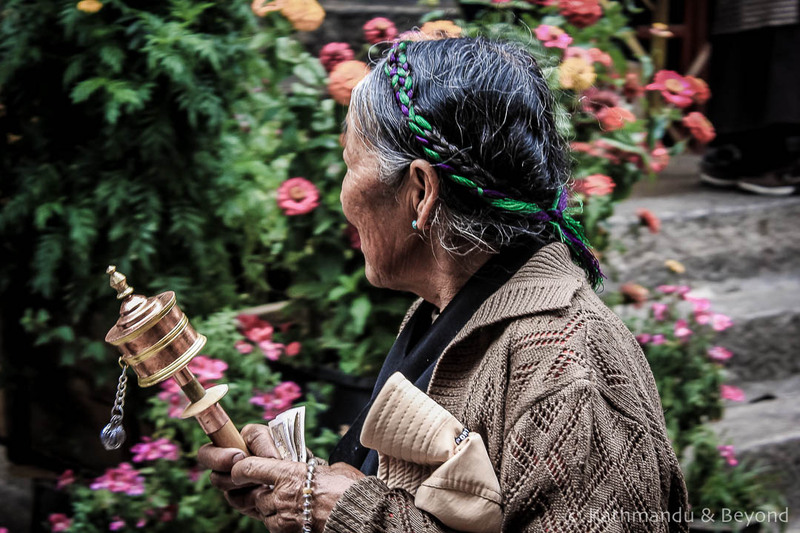 As is the norm, this pilgrim was going around the nunnery in a clockwise direction while reciting prayers and spinning her prayer wheel. Who said blue and green should never be seen? 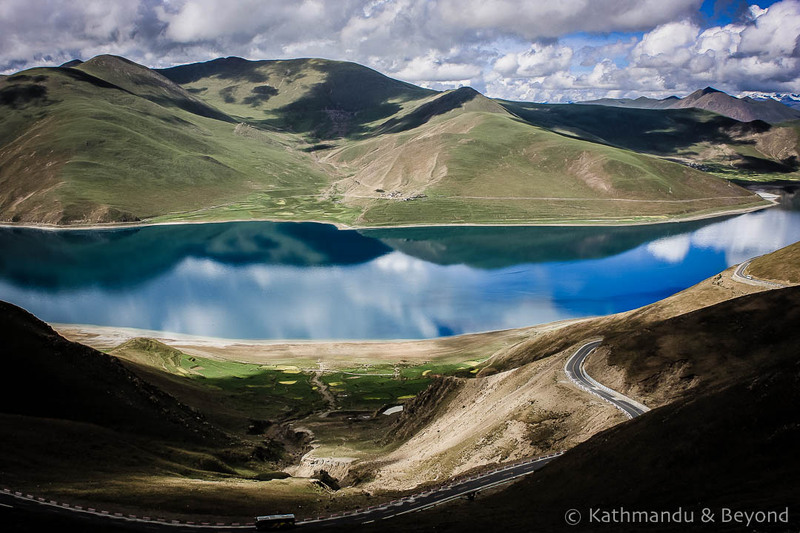 Most people get their first glimpse of stunning Yamdrok Lake from the top of the Kamba La (pass) and we were no exception. Beautiful photos. I was very surprised by the photo of the Shigatse Dzong. Nothing but broken walls and rubble when I was there in 1991 and 1994. I would argue the Tibetan areas of Yunnan, Sichuan, Qinghai, and also Gansu (where the spectacular Labrang Monastery is located) are in fact Tibet; it’s just that the Chinese imposed regional boundaries have lopped off portions of Tibet in order to diminish it. We’ve been to Kunbum Monastery but I have to confess, I haven’t heard of Zoige. I’ve looked it up and located it – it looks impressive and will go on our ever-expanding list of places to visit! Thank you for the compliment Robert. Getting to Mount Kailash had been an obsession of mine for quite some time and the whole trip didn’t disappoint!